Amy & Tobias Lehmann growing fabulous food on their farm in the NSW Riverina. WHERE CAN I BUY YOUR FABULOUS PASTURED EGGS? There are a few ways to get our pastured eggs – from one of our stockists, farmers’ markets, or delivered to you. Riverina Producers’ Market at the Wagga Showgrounds from 1pm-6:30pm EVERY Thursday. Wodonga Junction Square Farmers’ Market from 8am-12:30pm on the first Saturday of the month. 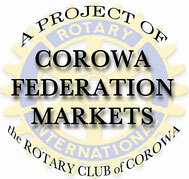 Corowa Rotary Federation Market from 9am-12:30pm on the first Sunday of the month. Regular deliveries are available to Albury, Wodonga, Wagga Wagga, Culcairn, Henty, Rutherglen, Corowa, and surrounds. We also do weekly deliveries to Sydney. Delivery day for Jindera, Albury, Wodonga and surrounds is Wednesday (11am onwards). Delivery day for Culcairn, Henty, Wagga, and surrounds is Thursday (10am onwards). Delivery for Rutherglen, Howlong, Corowa and surrounds is fortnightly but the day varies (just contact us to find out when our next delivery is due). Delivery outside regular times is subject to a delivery fee of $15. In your message, include the quantity and sizes required - first-time orders please make sure you also include a delivery address and contact phone number. The Market is held on the first Sunday of every month, (except February when there is no market), at Bangerang Park, Corowa from 9:00a.m. to 1:00 p.m.